I seem to be on a roll on tarts these days! I have re-discovered Dorie Greenspan and her rather maternal, comforting recipes. The header to this recipe said that this was no wishy-washy pumpkin pie and that's pretty right. The addition of caramel to a traditional pumpkin recipe adds a lot of punch and a deep jazzy depth to the taste of this tart filling. I like it a lot, I'm absolutely going to make this at Christmas. 1) Start with the making the graham crust, as in a prior post, this is 150g or half a packet of crushed Digestives biscuits and 75g melted butter, stirred together and pressed into a pie pan. Bake at 130 degrees for 15 min. 2) Sprinkle 1/2 a cup of sugar into a flat-bottomed pan and let it cook over the stove at high heat. Do not stir. It will start to caramelize and turn amber and bubble dramatically. When you've reached this stage, turn down the heat to medium throw in 3/4 cup of heavy cream. You will see the entire mixture bubble but if you stir it out, it will start to calm down into a caramel sauce. Add the rum and the butter, while continuing to stir at medium heat. This caramel sauce, by the way, is excellent for sticky toffee date pudding. 3) Add the cinnamon, ginger, nutmeg, vanilla essence and salt to the pumpkin. I used the scrapings from a vanilla bean instead. 4) Whisk together the pumpkin mixture and the remaining 1/2 cup of sugar. Add in the beaten eggs and the cooled caramel mixture. Pour into the pie tart. 5) Bake the pie at 150 degrees for 40 minutes. Toward the end, you might have to adjust the oven heat down, if the pie looks like it is hardening up well. The top should bake smooth and if you are worried about the top browning, you can turn your oven to a bottom grill heat mode, or cover the top of the pie with aluminium foil (while not pushing the foil directly onto the surface of the pie). 6) Cool the pie and finish with a sweetened whipped cream piping. Pumpkin goes really well with whipped cream. If you find that its hard to get the cream to set, one reason is that you should cool your bowl and whisk. The cooler the bowl, the easier it is for the cream to trap air. You can also beat the cream with some marscpone cheese, for a sweetened and thicker cream. Pipe it in a thick, decorative rim over your pumpkin filling top. 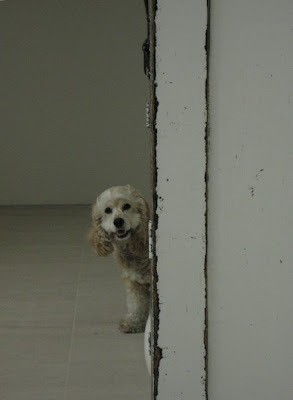 Colin is back in Singapore for a month! He presently is buried in books, so to tempt him to emerge, I thought I'd try some of the new concoctions I'd been working on. 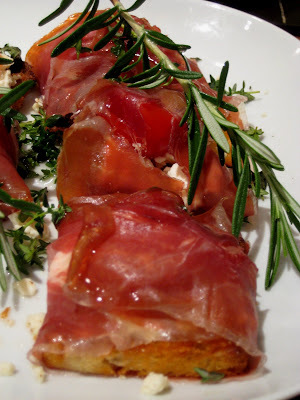 First up, my rendition of parma-wrapped baguette bread with mozerella, herbs and tomato. 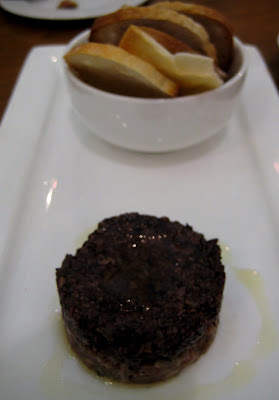 This crostino is something I keep ordering at Buko Nero and I keep wanting to try it for myself. I must say that I made a very hearty Italian version, with fresh herbs and cherry tomatoes. 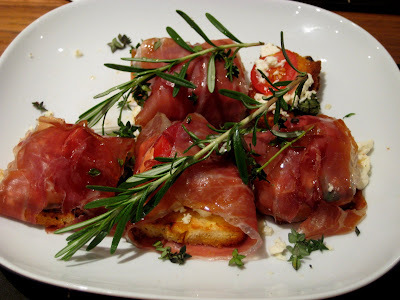 Next time, I will do it as the restaurant does, with dried herbs and slices of raw tomato. The only thing I discovered is what a pain it is to have to make these one at a time. The second dish was a coq au vin, that we'd made the night before. My chicken looks rather purple, don't you think? 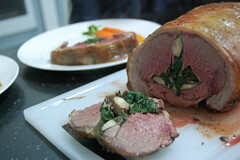 This is an old, tried and tested recipe, which you can find back in the blog archives. The third was a very clever salad, which I can't claim credit for. I call it Auntie C's King Salad. King because it uses lots of ingredients that you can find only in Japanese supermarkets, so this is a rather up-market salad. But it never goes wrong and I haven't discovered a single person yet who doesn't like it. That, in the food world, says a lot. 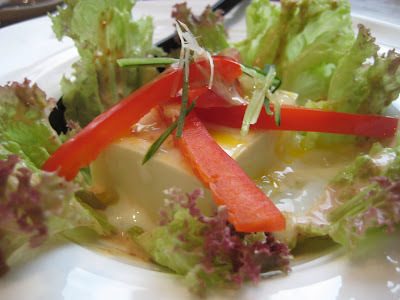 The secret to this salad is that other than the sesame sauce dressing, you use cubes of silken tofu which blend into the dressing to give a smooth, yummy coating to the salad. It's delicious but also very healthy, which is a plus! 1) Mizuna leaves (imported and available from Meida-Ya or Isetan, in the chilled veg section) washed, dried and cut up. I usually use two packets of these for 8 people, though you can use just 1 packet. 5) Kenko ginger sesame sauce, available from Meida-Ya supermarket. You can make your own ginger sesame dressing but this one is excellent. Add in 3 large tablespoons of this to the vegetables. 6) Toss all the ingredients together. 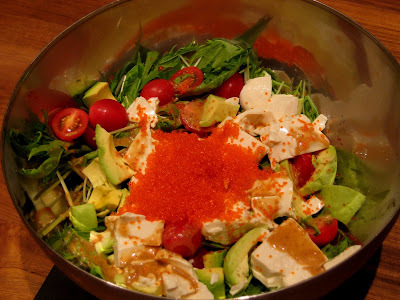 7) Add to the salad a packet of tobiko and ikura (you need to use slightly larger eggs that will give body, not the small ebiko, which tends to go limp). For dessert, we had panna cotta with peach and strawberry. 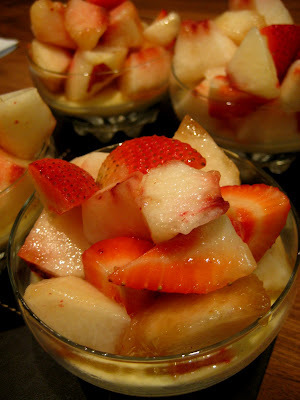 I discovered lately that panna cotta with vanilla bean goes marvellously with sweet peach juices. It's a subtle yet punchy combination of smooth and syrupy. After dinner entertainment was a lot of Wii playing. I would put up hilarious photos of Colin and cousin C. swerving a hand-held steering wheel in MarioKart but I don't think either of them want to be profiled in that light! One of my favourite recipes has to be lemon curd. This stems back from college, when my 'big sister' L. used to make pots of home-made curd that was finger-licking good! She's had more of a culinary impact on my life then she'll probably ever know! Later on, she told me she'd found a secret lemon cream recipe, that could be folded into a thick chocolate mousse, or used in cheesecake. Intrigued, I finally realized what she was talking about, Pierre Herme's Lemon Cream. here or look up Dorie Greenspan's cookbook. 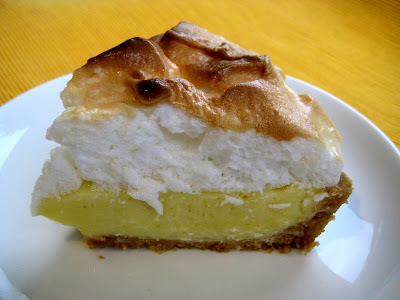 I decided to go the whole hog this time and make a key lime pie, of sorts, with the meringue. I was visiting my cousins in Pittsburg last year and made them an apple pie the first night for dessert and a promise to cook something everynight for dinner, upon which my cousin K. not missing a beat, solemnly said, you know... my favourite pie is key lime pie, if you're stuck for ideas tomorrow! So this is belatedly for him, I guess! I usually use graham crackers, crushed and stired together with melted buter to form a pie tart. You can use the recipe below, which make a pate sable crust, more like a shortbread. I like the old-school feel of the graham though. 1. Crush half a roll, 200g of digestives biscuits finely with a mortar and pestle. Melt 75g butter and stir it into the crushed biscuits. If you use more butter, it is easier to form a dough, but it's a trade-off in terms of oiliness! 2. Using the back of a spoon, press the mixture into and around the edges of a tart pan and bake for 15 min at 130 degrees. When you take it out, the tart should be harder and dryer but not burnt, nor completely solid. 1. Simmer a little water in a saucepan. Put the sugar and lemon zest in a large heatproof bowl and let it sit over the boiling water. Make sure the boiling water doesn't go into the lemon mixture. After 10 minutes, turn off the heat, rub the mixture together with your fingers until the sugar is moist, grainy and aromatic. Whisk in the eggs and then the lemon juice. You can, by the way, use limes or those Thai lemon-limes available in supermarkets, if pure lemon is not your thing. 2. Set the bowl over the pan of water and whisk continuously until it reaches 80°C (180°F). As it gets close to temperature it will start to thicken. This can take up to 10 minutes, so be patient! 5. Pour into an air-tight container and refrigerate for at least 4 hours (it will keep in the fridge for up to 4 days). When you are ready to assemble the tart, whisk the cream and spoon it into the tart shell. This cream texture gives body to your lemon tart. There are three alterations that you might like to consider. One is that I scrape a vanilla bean into the lemon mixture, to give it a kick. It subtlely makes the taste richer and more nuanced. The second thing you can do, if using graham crust, is to put a layer of coconut cream into the tart before layering on the lemon cream. I use the packet coconut cream available in stores. It makes the tart slightly more irreverant and island-y. 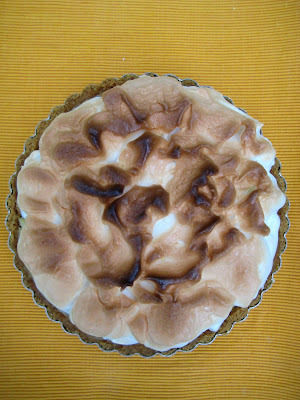 The third is the addition of an egg-white meringue. Now you have the tart baked and the lemon cream set and you've assembled a beautiful lemon tart (the lemon cream is just spooned into the tart and doesn't have to be baked again). It might be gilding the lily, but you can beat 2 egg whites with a spoonful of sugar, until they are stiff and glossy. Spoon the meringue roughly onto the top of the tart, going all the way up toward the tart edges. Pop the tart in the oven on a high shelf and grill it until the meringue starts to brown. Alternatively, you can also use a flame-thrower to give your meringue some colour. When done, the meringue should be firm and have developed a brown skin. The tart can be kept in the refrigerator for up to a week. It's been a year since we embarked on the journey of pho for M's birthday. How amazing is that? This year, we decided to go with a distinctly more Western menu! 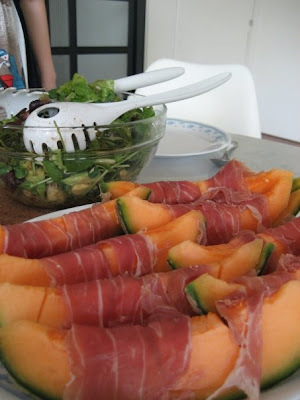 L. brought parma and melon, I tossed together a salad and D. and I started on our tiger prawn papardelle. I bought a kilo of fresh, large prawns at the wet market in the morning. I'd been eyeing these for a couple weeks and waited to have a worthy celebration. They are even more expensive than crayfish, though granted, much of the weight in crayfish is from the shell which can't be eaten. 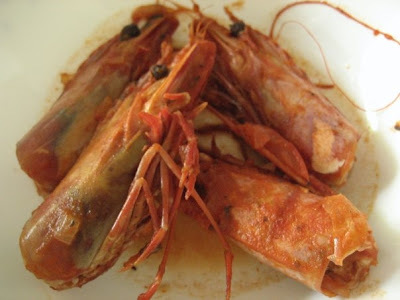 You need to pull off the prawn heads (and the whiskers) and shell and de-filibrate the prawns to begin with. Out of perhaps eight prawns, there was one gunky one that hadn't gone to the bathroom before being fished. D. bought whirls of fresh egg pasta and while that was boiling up, we fried the prawn heads with two cloves of chopped garlic, a cup of chopped onion and some fresh parsley and basil. 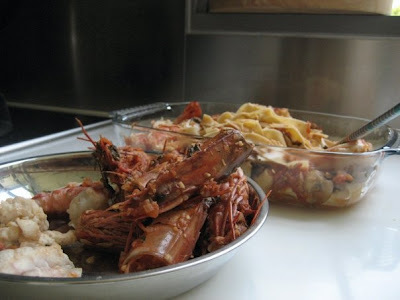 Then we poured in two cups of white wine and allowed the prawn heads to stew in their own juices. You can add more wine, if you like. Then we added a cup of chopped tomatoes and continued brewing. While D. dried and ladled the pasta into a serving dish, I placed the prawns on the top of the shells, letting them steam into pinkness. I prefer doing this to submerging the whole prawn so that your seafood stays firm, rather then getting soggy. Remove the prawns, lay them on the pasta and add three tablespoons of regular pasta sauce to the mixture in the pan. We cheated a little by using regular pasta sauce. You can do it the hard way and add tomato paste and more herbs and another round of tomatoes and it will cook up into a sauce. Then we poured the hot sauce over the pasta and prawns, removing the heads to a dish. I didn't think we'd need the heads but the girls fell on them like vultures, sucking out the meat that had been infused with white wine. I guess since these are large prawns, there's a lot of juice left in the heads. One great thing to do is actually to roughly tear up day-old ciabatta bread to make breadcrumbs and fry them in oil with thyme. Beware though, you are going to have to add quite a bit of oil and keep frying till they are hard and crisp. Then drain them and sprinkle them over the pasta for a crunchy first bite. 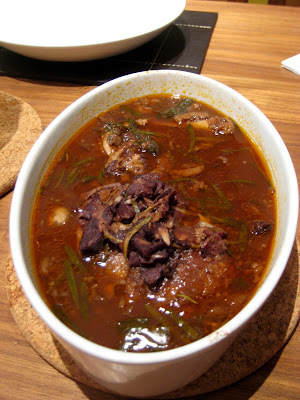 It really enhances the texture and of course, the taste of your dish. This is a really awesome recipe, the sweetness of the seafood tastes great with the savouriness of the tomato and sharpness of the onions, with the herbs to round it all off (and the breadcrumbs for effect and kick!). You must have really fresh seafood though but it is so worth a trip to the market. After lunch we had the cake, the presents and the dog-chasing. Lookee! There are differing reviews of this place but what amuses me is that no matter how poor people have found the food or the service, this place is packed out every weekend! They are clearly wanting for neither diners nor customers, as the Singapore Australian connection flocks here for their wines, cheeses and family gatherings. I met three of my Aussie friends while sitting here for an hour (that being said, I met even more Singaporean friends in that same hour). I was here a couple of weeks ago for tea and we had the avocado and salmon tarts, wagyu beef tartare and parma ham with truffle honey. It was all passable, the aesthetics were lovely and generally, I'm not a naysayer of this place. It's not my favourite place for lunch but it is a good place for coffee. It's the grocery equivalent of Cova in Paragon (used to be Marmalade Pantry) or the Mandarin coffeehouse in the days of yore. I guess people come here and to Dempsey Hill generally to soak in the atmosphere of what'd it be like to live in a first-world food country. And for whatever they don't have, there's Culina next door, or L'Organic down the street. Their produce is expensive to my mind and largely processed/packed foods (except their cheese and meats section). There are two things that I like here though. One is the white truffle honey, that is quite a revelation and will enable you to make your own truffle hams, fries and mashes. 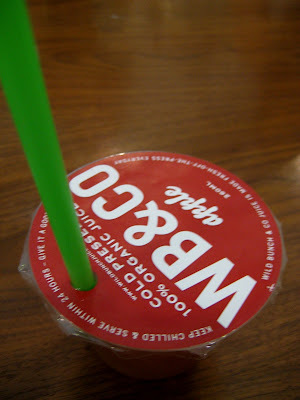 The other is the fresh fruit juice pictured here. No preservatives and no added sugar, just a crystal clear apple or beet or wheatgrass juice. It's meltingly good and ridiculously expensive. So bad that they sell them as shots at the "juice bar". I often wonder how personal a story one should tell on a blog. Not that this particular story is particularly personal...or is it? It's rather funny (I think at least) and hopefully I don't get into more trouble than I already have for it. When I was in university, I used to drive what in nostalgic reflection, can only be called a rather obnoxious car. Full of sound and fury, but with disgraceful mileage. In any case, the car was a bit of a police-magnet and I swear it wasn't me. One late night, while screeching to our favourite pho place (my roommate had, with her usual arbitrary estimate of time, told me it would take 10 minutes to complete a 20 minute drive to a shop that closed at 2am sharp), we were ambushed by a police car and told that we'd done 60 miles on a 20 mile road. I began my usual explanation of "no officer, surely not speeding", "responsible student" and "was I really going that fast". Then, I don't know what made me do it but I bawled, "but I'm so HUUUUUNNNGreeeee and I've studied ALL DAY!" and in a slightly sadder voice continued, "and this place closes at 2am...and I've had nothing to eat and exams tomorrow". Staring directly into his eyes, I solemnly appealed, "Don't you have children?" The car was very silent. Later, my roommate told me that in the dark, she was pinching her own calves to stop herself from bursting with laughter. She also claims that the real reason I avoided a ticket was because I'd bent over the car trunk in my Old Navy shorts, to "retrieve my wallet and driver's license". She's just bitter. We got our pho in the end, that night and almost weekly while we were in the Bay Area and that's only part of the distance we'd go for good pho. 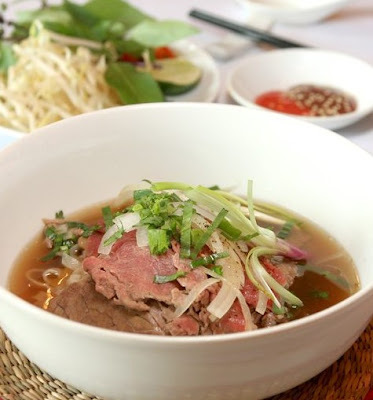 So going to this restaurant, Viet Lang, near the Asian Civilizations Musuem, was nowhere that far but disappointingly, it confirmed my notion that I can't find out-of-this-world pho while in-this-little-island. I've resorted to making it myself, as shown in previous posts (Search pho in the blog) and I like that a lot. But I'd also like to find a pho place that doesn't give me a massive MSG headache two hours later like this one did. The weird thing in Singapore, is that people don't seem to notice when the quality of Vietnamese food is bad- or is that just my impression? The appetizers we had were promising, a plate of rice paper rolls and a plate of very crispy and pretty satisfying fried spring rolls. The beef pho bowls were not bad looking either, although the beef was a bit skimpy and tough. But the proof is in the stock I think (or rather, the MSG is in the stock) and so a few hours later, I was feeling a bit sick and sick of the lack of solid Vietnamese restaurants here. This dish is something I've been stuck on for awhile and everyone who's tried it has been struck by the unique flavours and juicy texture. 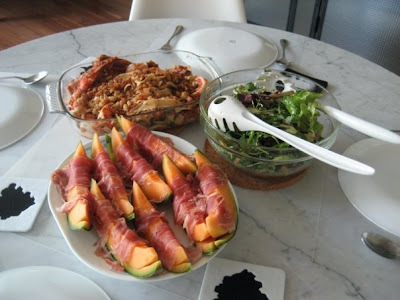 It's the simplest thing in the world to make and an easy dish to prepare fully before-hand when you have large parties. Buy some salmon fillets, prefably without bones and have it de-scaled, cleaned and seasoned with salt and pepper. Marinate the salmon for awhile with grated ginger, garlic and lime. It's up to you how much you want to use, for me, I prefer that the ginger and especially garlic are not overpowering but I like to have more lime. I had 8 people for dinner, so I used 4 fillets and sliced each into two fat strips. The amount of spring onions, cilantro and raisins is also variable, I like to use a more generous amount. Chop up a handful of spring onions, cilantro and raisins. Yes, chop the raisins, so that they are raisin pieces, rather then whole raisins. Normal black grape raisins will do, but I've tried this dish with cranberries and sultanas and it only improves. Seperate two sheets of filo pastry and butter in between them. 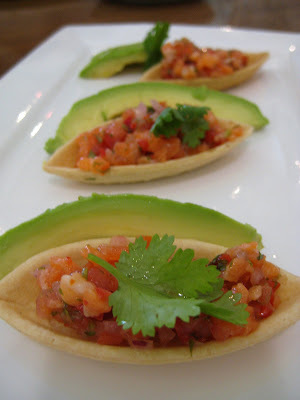 Place a stripe of salmon on top, just right of the center and heap the spring onions and cilantro on it. Follow with the raisins. Then, wrap the fish like you would a present, folding the short (right) side over and the two edges on the top and bottom, then rolling the package toward the far end of the pastry sheets. These packages can be neatly laid and stacked in a baking tray for up to two days, refrigerated. When your guests arrive, simply pop the whole tray into the oven and bake for 20 minutes at 140-150C degrees. It is almost impossible to overbake salmon but you want it to be crisp on the outside and slightly undercooked, juicy-bright and soft on the inside. The pastry will form a crackly crust to the parcels and the vegetables release juice upon cooking, which is then soaked up by the raisins, which will get all fat and slightly sticky. (In case you're wondering, you chopped the raisins to break the tough skin that would otherwise prevent the vegetable juices from being soaked up easily). Mix a few tablespoons of Thai sweet chilli with a tablespoon of water or lime juice and drizzle it over the fish parcels. The combination of the raisins, cilantro, salmon and sweet chilli gives a good kick which really makes the taste of this dish outstanding and memorable. I actually went to this place twice. I went the first time with my parents for lunch and I went the second time, becuase I had forgotten that I'd ever been the first time. Not a good sign, no? This place was apparently opened by some hot restaurant entreprenuer. Or was it the owner of Sakae Sushi? Same, same! It's meant to be a tonkatsu and tempura place but honestly, I prefer the other options on this island, like Tampopo or Tenshin. Part of the problem I guess is the name, I mean, talk about generic. 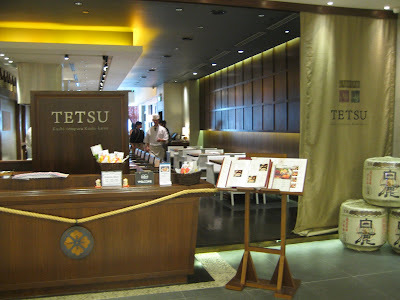 Tetsu, is about as supermarket-mall Japanese restaurant-ey as you can get, isn't it? Then, the prices. Not exactly cheap, with a $32 Salmon Sashimi and Ikura Don. Botan has much more for their $17 offering. Their sushi rolls are also a full $10 each. Then the decor, which is A+ for Boring. 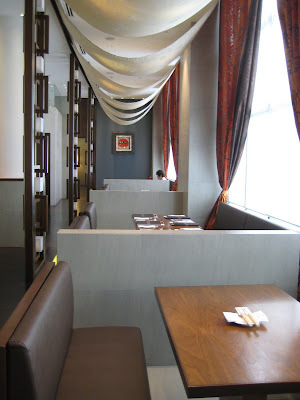 Rice caskets with ropes wrapped around them, dark slate walls, damask curtains, sushi boys with white peaked caps and dark wooden laminate floors, reminds me of Raikuchi in Dempsey. What of the food? Well, the resturant was empty both times when we entered but started to fill up toward the middle of lunch and dinner time. The free appetizer was a piece of cold tofu drizzled with ginger sesame sauce and sitting on a bed of lettuce. Then, we ordered two starters, one was the agedashi tofu, which was deadly anaemic. I was not very happy at this point of time. 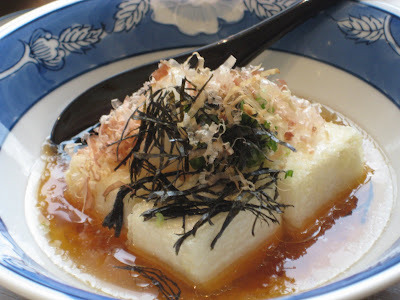 I hate agedashi tofu that doesn't even look toasted. 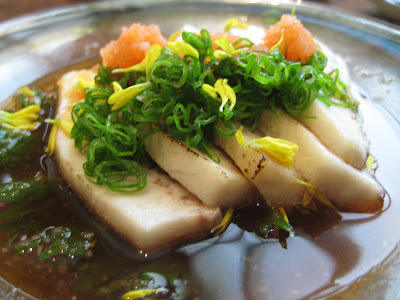 Then the second starter, which they suggested should be an aburi swordfish. Not a good idea as the fish was cold and chewy. 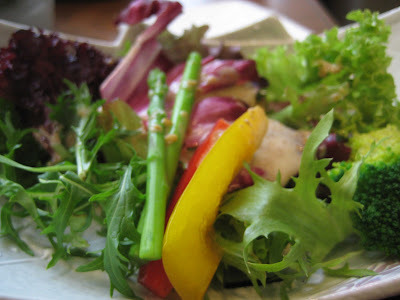 The salad that came with the dishes was rife with capsicum, another strike-out in personal tastes for me. 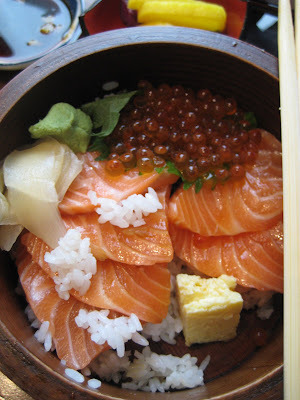 My lunch was the salmon and ikura rice bowl. There was more in it before I started, but not that much more. 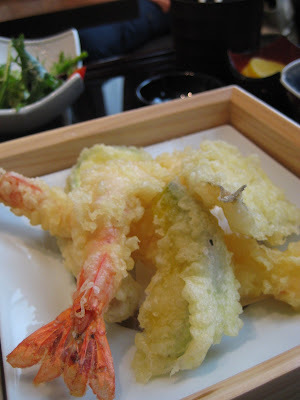 My companion had a tempura set and the second time I had just spider rolls and tonkatsu. The tonkatsu was alright, fairly, almost overly crispy if a bit dense but it was more expensive than Tom Tom and Tampopo and arguably not as juicy. The spider rolls were surprisingly good. If you look up other reviews, i think Mia and some others have had better experiences with more fried, kushiage-type courses, so perhaps that would be a good way to go. 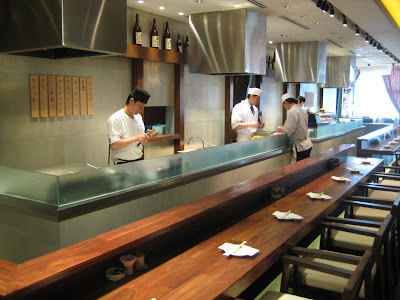 To me, it was all very pedestrain and rather like a poor meal experience at Akashi. Strange how this mall in particular seems to have a dearth of good food. I think it might be because usually the larger malls are the ones more able to sustain high traffic and large, consistent restaurants. Too good to miss! Kitchen appliances, pots and pans, warmers and stoves, all manner of equipment. Not that it needs to be any more crowded but definitely go check it out if you're in the market for anything. I've not been cooking much recently, and any cooking I've done has tended not to be very photogenic. I have, however, been slightly hooked on watching Gordon Ramsay's programmes, and decided to try one of his recipes, which you can find on Youtube (demonstrated by Ramsay himself) here. As first-time recipes always go wrong, I thought I'd take photos of the cooking process some other time, but surprisingly enough for once the recipe turned out perfectly the first time round. 1. 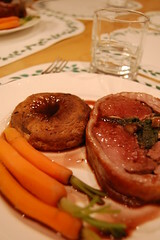 Trim as much fat from the saddle of lamb as possible, especially from the two flaps of skin. This prevents the lamb from swelling excessively during cooking and unwrapping itself, which creates a mess. 2. Heat some olive oil in a pan, and sweat the mushrooms (with salt and pepper) over moderate heat till the mushrooms start rendering their juices. 3. Drain the mushrooms in a colander. 4. Heat some olive oil and a tablespoon of butter in the same pan, and wilt all the spinach, placing them in the same colander. 5. Fold the mascarpone cheese into the spinach and mushrooms, and add the egg yolk, combining all the ingredients till they've formed a cohesive mass, then refrigerate while you prepare the lamb. 6. Halve the garlic bulbs crosswise, and salt and pepper them. This causes them to exude fluids with which you can season your lamb. 7. Lay the lamb skin side down, and rub it all over with the garlic. 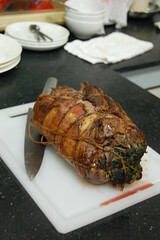 Line the centre of the lamb (the cavity between the two loins) with sage leaves. 8. Place your stuffing, which by now should have the consistency of soft butter, in the same cavity, packing it together neatly. 9. Pull one of the flaps of skin up and over the stuffing, to meet the other side, making sure it's pulled fairly tight, and fold the other flap over, creating a nicely wrapped roll of lamb. 10. Turn the lamb over (so that it doesn't start unwrapping itself) and stick two sage leaves against the ends of the saddle, which prevents any stuffing from coming out. Tie the saddle with the twine, and season with salt and pepper. 11. Preheat the oven to 200C. 12. Heat some olive oil in a hot pan, and fry the garlic bulbs and sage leaves. Add 2 Tbsp of butter and brown the lamb all over. 13. Transfer the lamb to a baking tray (unless your pan is oven-proof), and roast for an hour. 14. 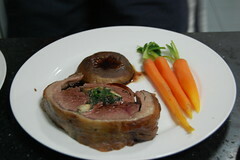 After an hour, remove the lamb and rest for 10 to 15 minutes, before slicing the lamb into steaks of desired thickness. Serve with your choice of sauce and side-dishes.